user warning: Table './active5_foxes/cache_filter' is marked as crashed and should be repaired query: SELECT data, created, headers, expire, serialized FROM cache_filter WHERE cid = '2:ff356e26a59fbcfe7f7fd02192887f49' in /home/active5/public_html/drupal6_multisite/includes/cache.inc on line 25.
user warning: Table './active5_foxes/cache_filter' is marked as crashed and should be repaired query: UPDATE cache_filter SET data = '<p><img alt=\"\" src=\"http://www.catchingfoxes.com/sites/www.catchingfoxes.com/files/resize/blog/IMG_2566-300x206.jpg\" style=\"border-top-width: 5px; border-right-width: 5px; border-bottom-width: 5px; border-left-width: 5px; border-top-style: solid; border-right-style: solid; border-bottom-style: solid; border-left-style: solid; margin-left: 10px; margin-right: 10px; margin-top: 10px; margin-bottom: 10px; float: left; width: 300px; height: 206px; \" title=\"\" width=\"300\" height=\"206\" /><strong><span style=\"font-size:14px;\">Resentment stirs as soon as I enter the kitchen. </span></strong>&nbsp;Most mornings, I hurry to get his juice, banana, and coffee to the table before he comes out his room. &nbsp;Setting it out before an empty chair seems like I am less a servant, and oddly, easier. &nbsp;Today, I am late.</p>\n<p>He waits as I hustle about the kitchen. There is a lunch to make. Dinner to get into the crock pot.&nbsp;&nbsp;I struggle with the weight of expectation that I will be waitress on top of wife, mother, teacher, student. <strong><span style=\"font-size:14px;\">The churning of irritation turns into a simmer.</span></strong> I carry over the juice and banana, silent as mouse so I don&#39;t interrupt his prayer. &nbsp;He prays. &nbsp;I serve. &nbsp;</p>\n<p>I&#39;ve been serving my father-in-law his daily meals for three years. &nbsp;I don&#39;t remember exactly how things happened at first, but an interesting pattern is now in place. &nbsp;If I am the one in the kitchen, he comes out of his room, sits at the table, and quietly waits to be served. &nbsp;This doesn&#39;t seem to be his pattern if his son is cooking. &nbsp;He enters into helping then, carrying the basket of napkins, glasses, or a gallon of milk to the table. &nbsp;</p>\n<p>He is capable. He drives. He goes to the fitness center most days. He enjoys restaurants regularly - places where he must carry his tray and drink to the table. Yet if I am in the room, he makes no attempt to get his own coffee.</p>\n<p>I set it before him on the table. &nbsp;He continues in silent prayer. &nbsp;I have no idea why he has developed this pattern; I am not sure he is even aware of the contrast. But I wrestle.</p>\n<p>I return to the stove to crack the eggs. I am stifling anger just minutes after my quiet time with the Lord. &nbsp;<strong><span style=\"font-size:14px;\">Indignation starts to boil in my spirit. &nbsp;</span></strong>Getting everything to the table requires six trips this morning. My sons are running late, too. One breakfast needs transformed into a portable meal for the student tardy for a college class. When I finally sit, all the others have finished their breakfasts, including Grandpa. &nbsp;I pick up my spoon, then remember I haven&#39;t given thanks.&nbsp;</p>\n<p>My turn to pray? After all the serving? When I am so broken? How do I pray to the one who served me through the cross, when I want to shed the servant&#39;s cloak after seconds in a kitchen?&nbsp;</p>\n<p>I bow my head and wait. <strong><span style=\"font-size:14px;\">I confess sin.&nbsp;I offer a&nbsp;simple sentence of gratefulness for yogurt and blueberries. And I ask again for a servant&#39;s heart. &nbsp;</span></strong></p>\n<hr />\n<p>Fox Catcher: &nbsp;&quot;Ask and it will be given to you; seek and you will find; knock and the door will be opened to you.&quot; &nbsp;Matthew 7:7</p>\n<p>&nbsp;</p>\n', created = 1555819831, expire = 1555906231, headers = '', serialized = 0 WHERE cid = '2:ff356e26a59fbcfe7f7fd02192887f49' in /home/active5/public_html/drupal6_multisite/includes/cache.inc on line 108.
user warning: Table './active5_foxes/cache_filter' is marked as crashed and should be repaired query: UPDATE cache_filter SET data = '<p class=\"rtecenter\" style=\"\"><a href=\"http://www.facebook.com/CatchingFoxes\" target=\"_blank\"><img alt=\"\" src=\"/sites/www.catchingfoxes.com/files/resize/social/facebook-64x64.png\" style=\"text-align: center; width: 64px; height: 64px; \" width=\"64\" height=\"64\" /></a><a href=\"http://pinterest.com/kimmrankin/\" target=\"_blank\"><img alt=\"\" src=\"/sites/www.catchingfoxes.com/files/resize/social/big-p-button-64x64.png\" style=\"width: 64px; height: 64px; \" width=\"64\" height=\"64\" /></a><a href=\"mailto:kim@catchingfoxes.com\" target=\"_blank\"><img alt=\"\" src=\"/sites/www.catchingfoxes.com/files/resize/social/mail-64x64.png\" style=\"width: 64px; height: 64px; \" width=\"64\" height=\"64\" /></a><a href=\"http://www.catchingfoxes.com/rss.xml\" target=\"_blank\"><img alt=\"\" src=\"/sites/www.catchingfoxes.com/files/resize/social/rss-64x64.png\" style=\"width: 64px; height: 64px; \" width=\"64\" height=\"64\" /></a></p>\n', created = 1555819831, expire = 1555906231, headers = '', serialized = 0 WHERE cid = '2:48be9f28bc948ea32b70445d0a590c98' in /home/active5/public_html/drupal6_multisite/includes/cache.inc on line 108.
user warning: Table './active5_foxes/cache_filter' is marked as crashed and should be repaired query: UPDATE cache_filter SET data = '<div class=\"fb-like\" data-font=\"verdana\" data-href=\"http://www.facebook.com/CatchingFoxes\" data-send=\"false\" data-show-faces=\"true\" data-width=\"280\">\n	&nbsp;</div>\n', created = 1555819831, expire = 1555906231, headers = '', serialized = 0 WHERE cid = '2:854065b9b61ff8596c8fa62e384317c7' in /home/active5/public_html/drupal6_multisite/includes/cache.inc on line 108.
user warning: Table './active5_foxes/cache_filter' is marked as crashed and should be repaired query: UPDATE cache_filter SET data = '<p><strong>Catch for us the foxes, the little foxes that ruin the vineyards, our vineyards that are in bloom. </strong><br /><em>Song of Solomon 2:15 NIV</em></p>\n<p>Metaphorically, the &quot;foxes&quot; are the damaging attitudes and actions that can creep in and threaten the love relationship of a couple and a home. &nbsp;Catching Foxes is committed to being a resource as you guard against the things that might injure and destroy the harvest you are striving to grow in your home.</p>\n', created = 1555819831, expire = 1555906231, headers = '', serialized = 0 WHERE cid = '2:132a8457abcc78748ef29251eaa8f1d7' in /home/active5/public_html/drupal6_multisite/includes/cache.inc on line 108.
user warning: Table './active5_foxes/cache_filter' is marked as crashed and should be repaired query: UPDATE cache_filter SET data = '<p><a href=\"mailto:kim@catchingfoxes.com\">kim@catchingfoxes.com</a></p>\n', created = 1555819831, expire = 1555906231, headers = '', serialized = 0 WHERE cid = '2:fe7b2055d10a2c25c439ca4710d86502' in /home/active5/public_html/drupal6_multisite/includes/cache.inc on line 108. Resentment stirs as soon as I enter the kitchen. Most mornings, I hurry to get his juice, banana, and coffee to the table before he comes out his room. Setting it out before an empty chair seems like I am less a servant, and oddly, easier. Today, I am late. He waits as I hustle about the kitchen. There is a lunch to make. Dinner to get into the crock pot. I struggle with the weight of expectation that I will be waitress on top of wife, mother, teacher, student. The churning of irritation turns into a simmer. I carry over the juice and banana, silent as mouse so I don't interrupt his prayer. He prays. I serve. I've been serving my father-in-law his daily meals for three years. I don't remember exactly how things happened at first, but an interesting pattern is now in place. If I am the one in the kitchen, he comes out of his room, sits at the table, and quietly waits to be served. This doesn't seem to be his pattern if his son is cooking. He enters into helping then, carrying the basket of napkins, glasses, or a gallon of milk to the table. He is capable. He drives. He goes to the fitness center most days. He enjoys restaurants regularly - places where he must carry his tray and drink to the table. Yet if I am in the room, he makes no attempt to get his own coffee. I set it before him on the table. He continues in silent prayer. I have no idea why he has developed this pattern; I am not sure he is even aware of the contrast. But I wrestle. 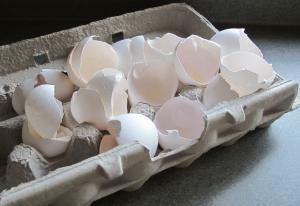 I return to the stove to crack the eggs. I am stifling anger just minutes after my quiet time with the Lord. Indignation starts to boil in my spirit. Getting everything to the table requires six trips this morning. My sons are running late, too. One breakfast needs transformed into a portable meal for the student tardy for a college class. When I finally sit, all the others have finished their breakfasts, including Grandpa. I pick up my spoon, then remember I haven't given thanks. My turn to pray? After all the serving? When I am so broken? How do I pray to the one who served me through the cross, when I want to shed the servant's cloak after seconds in a kitchen? I bow my head and wait. I confess sin. I offer a simple sentence of gratefulness for yogurt and blueberries. And I ask again for a servant's heart.